There are few things homier than the smell of baking bread. Nika Franchi, also known as Breadnik, seems to carry a whiff of fresh bread around her like a peaceful aura. “There’s something very nurturing and something very mothering about working with dough,” Franchi said. That care and attention comes out in her work. Her bread became an instant hit at BriarPatch, but she wasn’t always a baker. Her professional life began as a classically trained musician. After that, she was a globetrotting translator. “Four years ago, I didn’t know anything – the word yeast would throw me into a panic,” she laughed. One day, she decided to try her hand at bread making. The first attempt was successful, as was a second, and then she failed. Franchi didn’t let that failure stop her. She kept working at it until she figured out the process and was happy with her creations. Soon after, fate stepped in. She brought a loaf of her bread to her local farmers market in Ohio to give to a friend. The friend didn’t meet her, so Franchi decided to leave it with the market manager. The manager tried it and wanted more, and Breadnik was born. When the economy turned south, Franchi became a full time bread baker, selling 150 loaves a week as well as selling soups and preserved foods. As popular as her bread was in Ohio, her Nevada County friends said, “We want you here.” Originally from Moscow, Russia, Franchi had lived in many places, but Nevada County was home. She, her husband, and her youngest daughter decided to pack up their equipment and move. They now live outside of Grass Valley. Currently, Breadnik produces around 150 loaves a week. All of the recipes are Franchi’s creations, based on the memories of breads consumed during vacations in Italy. 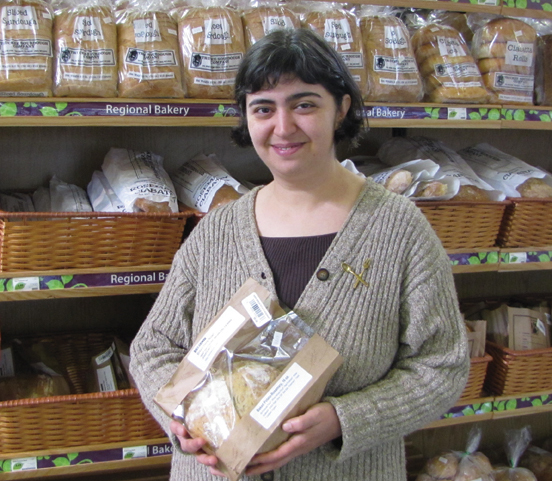 The business is expanding sustainably, though that requires her to work a baker’s schedule – six days a week. “I’m always either mixing or baking,” she said. Living locally and sustainably is one of Franchi’s main focuses. She’s working with local farmers and selling to the local markets. She’s also using available ingredients to create a bread of the month as well as her staple loaves, including the low gluten Russian Coriander Rye. More information on Breadnik can be found at her blog, her Facebook page, or by calling (530) 913-9673. I’m half town mouse and half country mouse. My mom loves her creature comforts – full-service cable, air conditioning, and oodles of places to eat out on a whim. My dad grew up on a dairy farm, getting in scrapes, being a buddy with dirt, and being happiest sans roof. 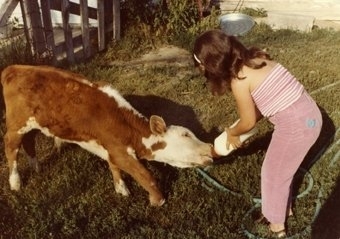 Me, and the calf I saved from a ditch, a long time ago. By the time I came into the picture, my paternal grandparents had shifted from dairy cows to beef, Polled Herefords to be exact, and moved to Montana. My brother, sister, and I spent many a summer day up at their ranch, getting into our own scrapes, helping where we could, and learning the all-important lesson of farm to table. I was really lucky to get these experiences. To look at me, you’d think I’m all town mouse. In fact, whenever playing, “To Tell the Truth,” my story about herding cattle always gets chosen because, well, no one looks at me and thinks, “Well golly, of COURSE she’s herded cattle.” Part of my luck, I feel, is that I was exposed to the whole circle of life and have a pretty priceless understanding of how a calf that I rescued from a ditch would someday end up as hamburger, and I was okay with that. Understanding breeds acceptance. 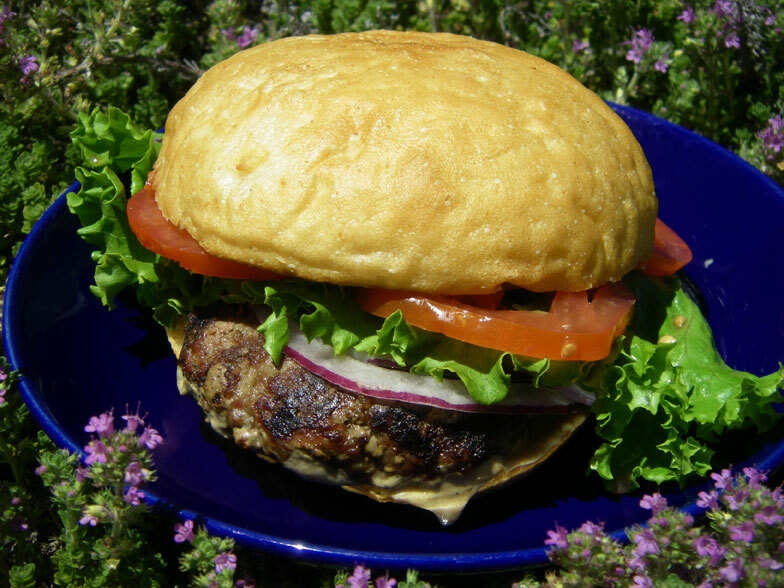 When I became a vegetarian, my beef-raising family accepted that change with nary a blink. When I returned to eating meat a few years later because of my health, that too was accepted. While I never came back to the place where I ate as much meat as I had before going veggie, I gotta say, a good grass-fed, grass-finished steak or hamburger is a lovely thing to experience. Locally, we’re gifted with a wonderful beef rancher by the name of Jim Gates. His beef tastes as good as it gets – lean, juicy, and chock full of flavor. Jim is something of a rock star around these parts. 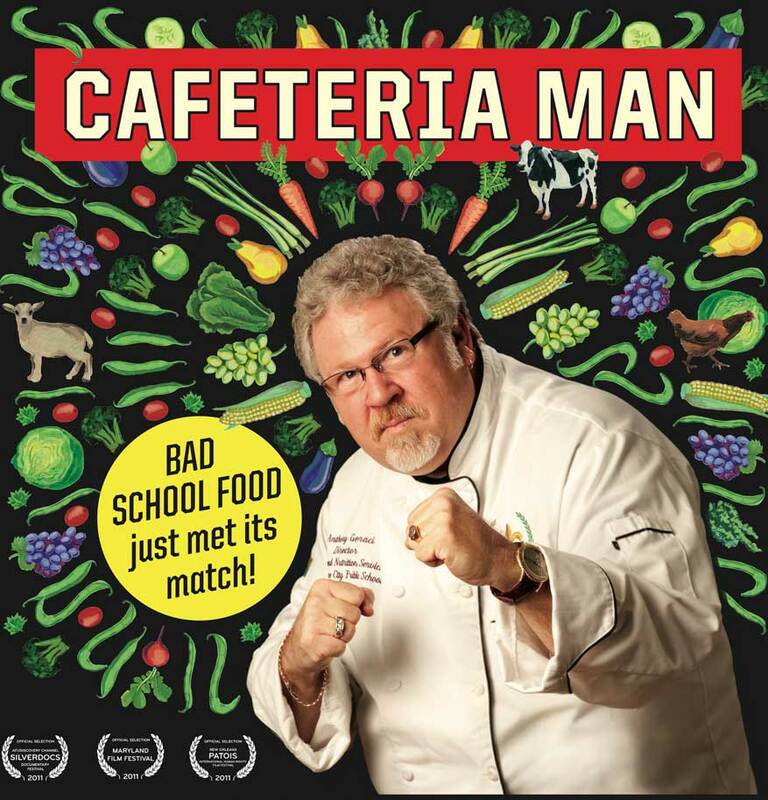 Mister Salt-of-the-Earth, brusque rancher-man is like a palette-cleanse – he tells it like it is, with an impish sense of humor.